Campaign manager Sara Soka (center) celebrated with fellow supporters after a soda tax was passed in California in 2014 to raise money for schools, parks. In San Francisco, in 2014, the beverage industry spent $10 million to defeat a popular soda tax put in front of voters to raise money for city schools, health programs, and parks. That comes out to about $11 spent by Big Soda for each resident of the Golden City. In Philadelphia, the beverage industry, according to the latest spending numbers obtained by the Inquirer, has already poured more than $2.6 million into the avalanche of misleading ads (it's not a grocery tax!) blanketing our airwaves against the tax designed to fund universal pre-K programs, build community schools and repair crumbling recreation centers. Here's the catch - this time around, the beverage barons only have to win over City Council. There are 17 Council members, so that comes out to about $152,000 in ad dollars each. Philadelphia is a battleground Big Soda cannot afford to lose. 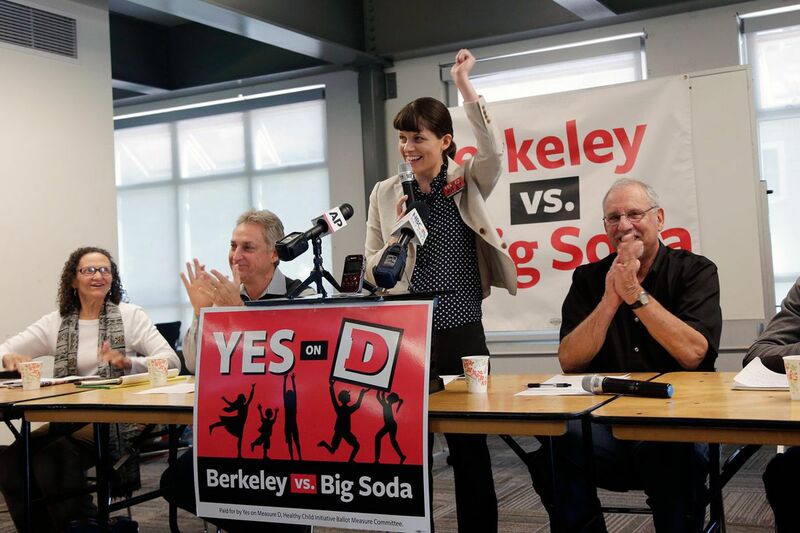 Yes, Berkeley, Calif., wedged its Birkenstock-shod foot in the beverage industry's door when it passed a soda tax in 2014, becoming the first city in America to do so. But if Philly, the poorest big city in the nation, a place teeming with those who suffer most from the ravages of sugary drinks, is able to best the soda titans and pass a tax, that door would be kicked right open. Big Soda has drawn a line in the sand in Philadelphia - a line that cuts through our city's poorest neighborhoods. Big Soda's fear is simple: If Philly taxes the sugary stuff, big cities across the country could follow suit. "This is a major front in this fight," said Kevin Feeley, spokesman for Philadelphians for a Fair Future, the city's pro-soda tax coalition. "The beverage industry has made it clear they intend to take advantage of their almost unlimited resources." And the fight is just getting started, with a Council vote likely not coming until June. The folks at Fair Future, which consists of 62 civic, labor, and faith groups from across the city, have yet to air any ads. Feeley said they're working on it. Any way you look at it, the soda tax debate is a numbers game. The money is flowing from Big Soda like a Big Gulp. The money the tax could raise for programs to help city children climb out of poverty. The number of lives the tax could save. That potential number was laid out this week in a Harvard University study of Philly's proposed soda levy. If the 3-cents-per-ounce soda tax passes, a decade from now there would be 36,000 fewer cases of obesity in the city each year, they say. And just in a few years, 2,280 fewer cases of diabetes. If we raise the price of soda 3 cents an ounce, they say, 730 Philadelphia deaths would be averted in the next 10 years. If saving 730 people from the grave doesn't move you, they also say the city would save nearly $200 million in health-care costs in the next 10 years. The soda tax is not perfect. But it's where we are now. It's where we have allowed ourselves to get after decades of failed efforts to rescue collapsing neighborhoods and the hundreds of thousands of Philadelphians slipping into despairing poverty. It's not a radical plan. It's common sense. It's like what Mike McCrea, the head of the citywide Recreation Advisory Council, said the other night at a community City Council meeting on the tax in Fairhill. "We can't afford to kick the can down the road," he said, to the jeers of protesting teamsters and the cheers of his neighbors. After adding up all the numbers, after doing the math, it would be folly, it would be shameful, to keep kicking the can.